I'm a screenshot junkie. I freely admit it. But this game provides all sorts of places and situations where a screenshot to preserve the moment is vitally necessary. The above is a case in point. This is on the elemental plateau in Draenor. 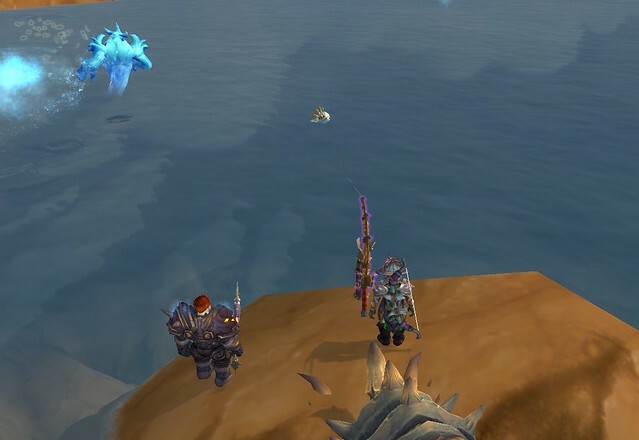 That's a purple outlined fishing pole and there's a murloc. I won't tell you what happened when I clicked the pole. Suffice it to say it was quite amusing. I love to fish in game so they didn't need to entice me to try it. Is the murloc used for bait? You'll have to go find out. Submissions for "Out And About" are welcome. They should be in .jpg format with name plates removed. You can write your own caption or I'll do it, but I'll need to know who and where and what's going on. Please include your toon name, guild and server if you're not in Spectacular Death. Send photos to floortanking@gmail.com. And that's my bodyguard, Delvar Ironfist, alive. I hadn't killed him at this point. Poor Delvar. He's getting really good at floor tanking.